In one of the few studies of the early immigrant Orthodox rabbinate in North America, Ira Robinson has delved into the Jewish community in Montreal in the first three decades of the twentieth century. 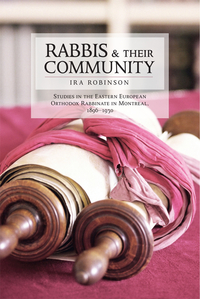 Rabbis and their Community: Studies in the Eastern European Orthodox Rabbinate in Montreal, 1896-1930, introduces several rabbis who, in various ways, impacted their immediate congregations as well as the wider Montreal Jewish community. Most studies of the early North American rabbinate focus on only one rabbi. Here, though, Robinson carefully examines the interrelationship among a number of rabbis sharing the same communal "turf." He has diligently researched the unpublished source material these men, generally forgotten to history, left behind. Their writing offers a valuable glimpse at some of the struggles and challenges they faced in their own community, as well as those faced by Canadian Jewish society as a whole in the early twentieth century. Robinson introduces the reader to such leaders as Rabbi Hirsh Cohen, a fixture in the Jewish community of Montreal from 1901 through the late 1940s, Rabbi Simon Glazer, Cohen's main rival for the chief rabbinate, and revolutionary thinker Rabbi Yudel Rosenberg. The issues they faced, such as the Kosher meat wars of the 1920s, and the institutions they created, most notably the Jewish Community Council of Montreal, were factors of fundamental importance for the development of the second-largest Jewish community in Canada. Ira Robinson is a professor of Judaic studies in the Department of Religion at Concordia University in Montreal. He has taught at Concordia since 1979 and has published extensively in the area of Jewish studies.